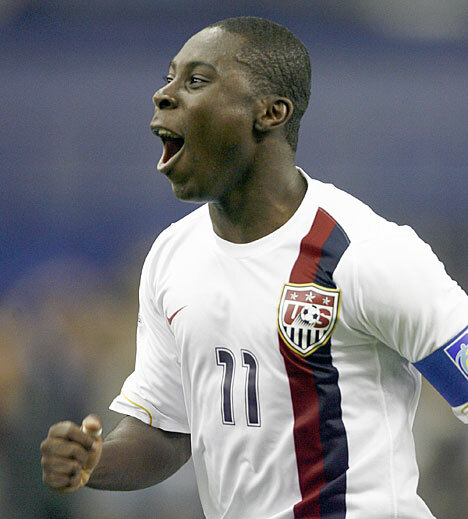 NEXT STOP FOR FREDDY ADU IS TURKEY! will be loaned to Second division team from Black see region, Caykur Rizespor. Rizespor plays in the Banka Asya League in Turkey and is in third place with a 9-5-4 record, two points behind Orduspor and Samsunspor. Kenny Miller scored his first goal in Turkey agaisnt Galatasaray as second-placed Bursaspor moved within two points of Super League leaders Trabzonspor on Saturday after beating Galatasaray at home with the score of 2-0. Miller opened the scoring after 37 minutes and Gokcek Wederson scored the second goal. Galatasaray's Ayhan Akman sent off the field, after 64 minutes and could find no way back. Galatasaray young keeper Ufuk made two huge mistakes in this match! Kenny Miller after the match said,"there was a perfect atmosphere, the first goals are always important. Vederson's goal was beautiful "
"Since I scored my first goal, it will be mine, I will keep it" he said ..
Antalyaspor scored the first by Tita and than Sivasspor tied the match with Erman Kilic. Polish player Kamil Grosicki. assisted on Sivaspor goal. In Izmir, Bucaspor thrashed Kasimpasa with the score of 4-0 ! with this score Bucaspor reached to 15 points and left Kasimpasa at the bottom of barrel! In Karabuk, Karabukspor and Fourth place team Kayserispor played for scoreless draw..
Perhaps, "the match of the week" will take place on Sunday, In Istanbul when Fenerbahce host Turkey's top team, Trabzonspor. But, wait that is not the only important match will effect,the top this weekend..
On Saturday, the second place team and last year's Champions Bursaspor will face Galatasaray at home in the last match on Saturday night! Also on Saturday, Third place Kayserispor, will travel to Karabuk. This match will be played in day light ....the starting time is 12:30 CET.. In the other early matches on Saturday, Sivasspor will be home against Antalayaspor and Bucaspor will host leagues last place team Kasimpasa in Izmir. Sivasspor,Bucaspor and Kasimpasa are the last three teams from bottom..
From top the bottom, teams will fight for the points this weekend! On Sunday,in the late match, everyone will watch this very important match between Fenerbahce and Trabzonspor! The best team of the first half of the season Trabzonspor, did not start the second half good! So they are in a slum, little bit! Also on Sunday in the early matches, Besiktas take on Istanbul BB, at Ataturk Olympic Stadium Gaziantepspor play Genclerbirligi at home and Ankaragucu will host Manisaspor at home. On Monday the 19th week will close with Eskisehir - Konyaspor match. Not to forget, Kayserispor plays in early match before Bursaspor takes on the pitch. Kayserispor winning in away match, against Karabuk will make them dead even 38 points with BUrsaspor! That would put a lot of pressure to Bursaspor against Galatasaray too! So, that is why this weekend culd be the turning point in the league in my opinion. Michael Bradley To Galatasaray ? According to many reports on internet, American soccer player Michael Bradley headed to Galatasaray of Turkey! University soccer team and current head coach of the United States men's national soccer team. Residency Program in Bradenton, Florida — the dedicated facility for the training of the Under-17 national team — for four semesters, from the Autumn 2002 to Spring 2004. He is also USA National team player,coached by his father Bob Bradley. Labels: Michael Bradley To Galatasaray ? The draw for the Ziraat Turkish Cup's quarter Finals, took place in Istanbul Today. There will two matches played between teams .The first matches will take place on February 2 and 3rd of February and the second leg matches will play on March 2. and 3. Besiktas and Galatasaray most likely will meet in the semi-final match if they win their quarter final matches. Labels: The draw for the Ziraat Turkish Cup Quarter Finals. BESIKTAS IN AND TRABZONSPOR OUT IN THE TURKISH CUP..
Three of the top teams in the Turkish Super League will not be in the Turkish Ziraat Cup! Gaziantep Buyuksehir Belediyespor surprised a lot of people and beat Manisaspor at Manisa with the score of 1-2 and advance to the quarter finals with Besiktas from Group B ! Besiktas the start studded team with Portuguese connection scored two goals in the first half and Trabzon came back in the beginning of the very first seconds of second half but could not scored the second goal to tie the match! Also in this match Polish player Glowacki for Trabzonspor and Ersan Gulum got hurt during the match and the latest news is, Ersan Gulum is done for rest of the year ,according to reports.. So, the top team team who won the Turkish Cup last year is out of the Turkish Cup! Also on Thursaday In Malataya, Yeni Malatya will host Ankaragucu if Anakaragucu get a win in Malatya, the team who have 7 points Bucasspor will not advance in this group! Will it be Ankaragucu,Genclerbirligi or Bucaspor? On Sunday in the Turkish Super league, Galatasaray won their first league match in their new home Turk Telekom Arena, against Sivasspor and made a brand new start to the league! On the other hand , Bursaspor , number two in the league, was held by Konyaspor in Konya! In the 18th week, while three Istanbul giants. won their match, The top team Trabzonspor and Bursaspor were held . The league leader Trabzonspor lost two huge points at home in this race..
That might hurt them in the league, later on! Also, Trabzon will travel to Istanbul to play with ,Fenerbahce ,Besiktas and Galatasaray in the second half! This coming weekend they will face Fenerbahce in Istanbul while Bursaspor will host Galatasaray at home..
Today Kayserispor will close the 18th weekend matches at home against Istanbul BuyukSehir Belediye. Kayseri must win this match if they want to stay on the chase too.. But, a win against Istanbul B.B will not come easy! BESIKTAS AND FENERBAHCE WIN ,TRABZONSPOR LOSE LIFE LINE! Turkish Spor Toto Super League second half started on Friday. Super League high-profile and transfer record holder team Beşiktas demolish Bucaspor with 5-1. Turkish Super League’s first half leader Trabzonspor drawn by Ankaragücü 1-1 on Saturday. One of the Super League most dominant team Fenerbahçe, won over Antalyaspor later on Saturday. The days another match which played later on Saturday, Manisaspor defeated Karabükspor with a 1-0. Besiktas new Portuguese gang showed their perfect quality against one of the Spor Toto Süper League’s weakest team Bucaspor. The host netted three-goal lead at the break thanks to eighth-minute strike by Brazilian goalscorer Mert Nobre, and further efforts by Guti (19 penalty) and Simao Sabrosa (44). Nobre added his second of the night on 64 minutes while Guti did likewise nine minutes later. Bucaspor restored some pride when Musa Aydin netted a consolation 15 minutes from time. The win lifted Besiktas to 31 points and fifth in the standings while Bucaspor remains second-bottom. Turkish Super League first half leader Trabzonspor unexpected drawn by Ankaragücü at home. Brazilian midfielder Jaja go ahead Trabzonspor on 20th minutes. Trabzonspor wasted good chances during the game with goalscorer Umut Bulut. Ankaragucu Drago Gabric who is also Trabzonspor and rented to Ankaragücü, equalised match on 61th minutes. The other match of the day, Fenerbahce defeated Antalyaspor on a away match. Fenerbahçe who took three puan against Antalyaspor by Gökhan Gönül’s spectacular goal has achieved this season’s second away victory. On the other matches in Super league, Manisaspor beat Karabukspor 4-2 at home, Eskisehirspor defeated Genclerbirliği with a 1-0 at away match. Sunday will see Galatasaray stepping into its Türk Telekom Arena to take on Sivasspor for the first time for a league match. Things do not look bright on the pitch either as Galatasaray struggled to beat third-tier side Beypazarı Şekerspor 3-1 the Ziraat Turkish Cup and failed to impress in a 0-0 draw against Antalyaspor on Tuesday in the same competition. Another goalless draw against Ajax. moves over the break; purchasing Colin Kazım Richards from archrival Fenerbahçe drew heavy reaction from the fans, while luring striker Bogdan Stancu and Colombian goalkeeper Robinson Zapata from Steaua Bucharest, Argentine midfielder Juan Emmanuel Culio from Cluj, and Yekta Kurtulus Turkish bottom-dweller Kasımpasa created little excitement among fans. Defending champion Bursaspor made one of the biggest transfer moves of the current window, as the Crocs signed Scottish striker Kenny Miller, who scored 49 times in 81 appearances for Rangers in the last two and a half seasons. Bursaspor will be under a lot of pressure just like Galatasaray on Sunday in the Turkish Super league. 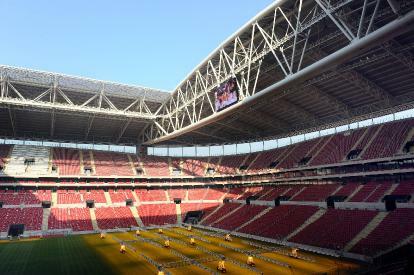 Galatasaray's new stadium in Istanbul, "Turk Telekom Arena", will be open on Saturday. Turk Telekom Arena has 52,647 spectators capacity, and it is one of the most technological and authentic sports complexes of Turkey. Galatasaray and Ajax team will play a friendly game at 8:45 p.m, local time on Saturday. Turkish Prime Minister Recep Tayyip Erdogan is expected to attend the inauguration ceremony of the stadium. Ceremonies at the stadium will begin at 6:00 p.m. on Saturday. According to Galatasaray President Adnan Polat,the stadium is the only stadium in Turkey to fully satisfy UEFA criteria for hosting the European Football Championship in 2016. Because of the very limited parking spaces (about 4500 hundred) The club urges fans to use the newly-opened metro line to Seyrantepe in order to avoid causing heavy traffic jams. One negative thing about this project the roads around the stadium is not completed yet! The curtain then finally fell on the Ali Sami Yen Stadium, which had served Galatasaray for 47 years. The venue was instrumental in the Lions clinching the UEFA Cup and the UEFA Super Cup in 2000, a total of 17 league titles and Turkish Cups, 11 Turkish Football Federation (TFF) Super Cups, 12 Sports Writers (TSYD) Cups, five Chancellor Cups and the 50th Year Cup (1973). Galatasaray has now moved to it new venue, Aslantepe,Turk Telekom Arena. All 18 teams in topflight Turkish football have chosen Antalya and its environs to prepare for both the cup and the second half of the league season. Defending champion Bursaspor is at the Topkapı Villa Otel in Kundu; leader Trabzonspor at Gloria Golf in Belek; Fenerbahçe at Arcadia in Belek; Beşiktaş at Gloria Serenity in Belek; Galatasaray at Rixos Lares in Kundu; while Antalyaspor is training at its own facilities. The 18 clubs in the Spor Toto Super League are currently storming both the domestic and international transfer market for players to boost the standard of play of their respective teams before the one-month January transfer window closes. Hence there is bound to be plenty of selling and buying, sooner rather than later, as the teams will be busy offloading the redundant players and replacing them with new ones. The second half of the league season will resume on Friday, Jan. 21, with Besiktas hosting newcomer Bucaspor at the İnönü Stadium in İstanbul. But before that there will be the Ziraat Turkish Cup matches between Jan. 11 and Jan. 17 to play for.